Neoplasms arising in germ cells are relatively uncommon, but are highly curable malignancies. The incidence of primary testicular tumors ranges from approximately 2.1 to 3.1 cases per 100,000 males in the United States and Great Britain . Amongst those cases of germ cell tumors about 1% to 2% have an extragonadal origin. These tumors possess a similar spectrum of pathologies as their primary testicular counterparts [2–6] and include all types of seminomas and nonseminomas. A scheme of the interrelationship of these neoplasms was developed by Teilum  and is depicted in figure 1. 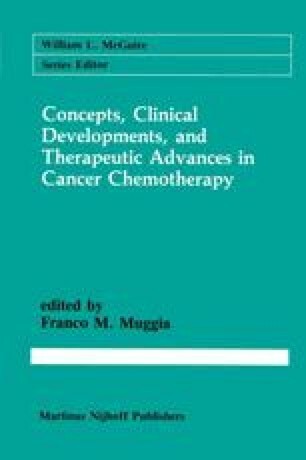 Several controversies surround the subject of extragonadal germ cell tumors (EGGCT) including their pathogenesis and etiology, the question of ‘burned out’ testicular primaries, the necessity for orchiectomy, and the observation that these tumors may be more refractory to the standard chemotherapeutic regimens used in primary testicular cancer. This review will attempt to provide a review of EGGCT’s including their origin, clinical syndromes, past therapeutic strategies, and further directions of treatment.